It’s been a worrisome month in the food allergy community. In two separate incidents, a little girl experienced anaphylaxis aboard an airplane as a result of a life-threatening nut allergy. As a parent of a peanut-allergic child, my breath just stops when I read such a story. I know I am not alone. Twitter is abuzz with reactions to these terrifying incidents. One of our greatest challenges as parents is to figure out how to assimilate these stories. Should we halt our travel plans to places far from home — that is, until policies change? Or do we continue flying, knowing that anaphylaxis in the air is a rarity? I described what it’s like to process the information we read, both the news stories of anaphylaxis in the air and the research to date, in my post: Flights, Peanuts, Allergic Kids — And, Yes — Anxiety. 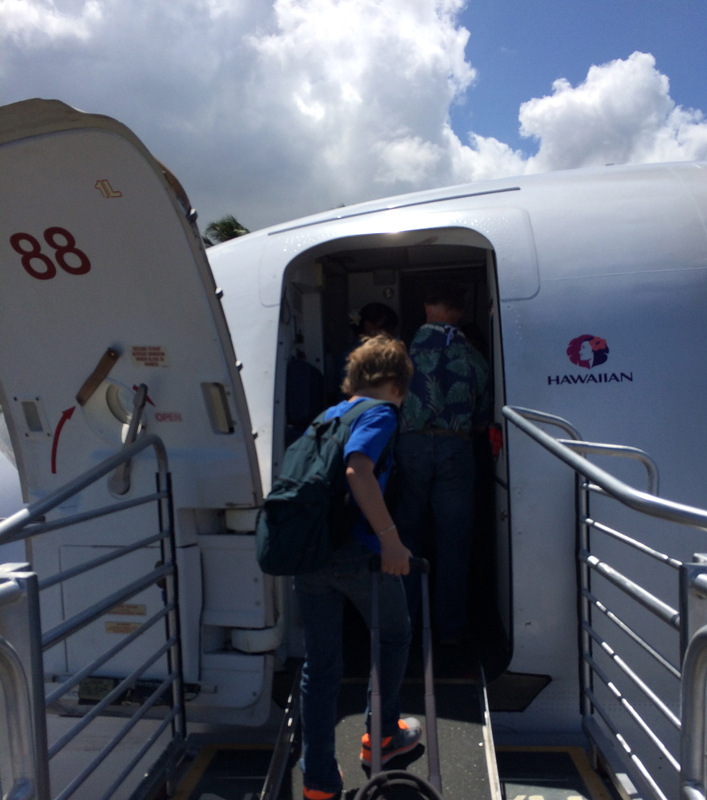 I had wondered if we should cancel our family trip to Hawaii — a trip that involved a five hour flight over an ocean. It’s not that we are new to flying with a peanut-allergic child. This allergy has been with us for 11 years. What’s new is that I had connected to Twitter and on-line support forums. We followed the protocol for preparing for a flight and managing your flight day nicely outlined by No Nuts Traveler. Taking these steps is highly recommended and increases the likelihood that you’ll have a safe flight. Unlike previous trips, we phoned my son’s allergist’s office to discuss preparations. The nurse answered my questions about flying with his peanut allergy. Last spring, I learned that individuals with asthma may be at increased risk of a severe/fatal food allergy reaction. My son has had mild asthma since infancy. After five years of immunotherapy for his environmental allergies, he no longer needed his preventative medication (a corticosteroid) so we discontinued it a few years ago. We contacted the allergist’s office to reassess my son’s asthma. Medication was added back in to his regimen in order to optimize his lung function. We wanted to his asthma in great control in preparation for the flights. Airline policies certainly vary! Allergic Living’s chart is very helpful. We flew Delta Airlines for the majority of our flights and they followed through with their policies. They made 1 – 2 announcements prior to boarding, alerting passengers to the fact that a passenger with a life-threatening peanut allergy would be on board so no peanuts would be served during the flight. The gate agents then requested that passengers refrain from eating peanuts aboard the plane for the safety of the allergic passenger. It was a huge relief. I noticed one woman scowl furiously in response but everyone else seemed unaffected. We were allowed to board the plane early, sometimes even being the first ones on in order to clean my son’s seat. Once we were in the air, the flight attendants made announcements again about serving pretzels in place of peanuts and asking passengers to refrain from eating peanuts while on board. It eased our anxiety. We took eight flights total on our vacation and never saw anyone eating peanuts. What a relief! Of the six Delta planes that we flew on, none of them had cloth seats. We were delighted! Easy to clean. Allergen concerns lessened. I wonder if Delta has replaced all the fabric seats in their fleet? We have never opted to purchase seat protectors (Plane sheets). With non-porous seats, they are unnecessary. 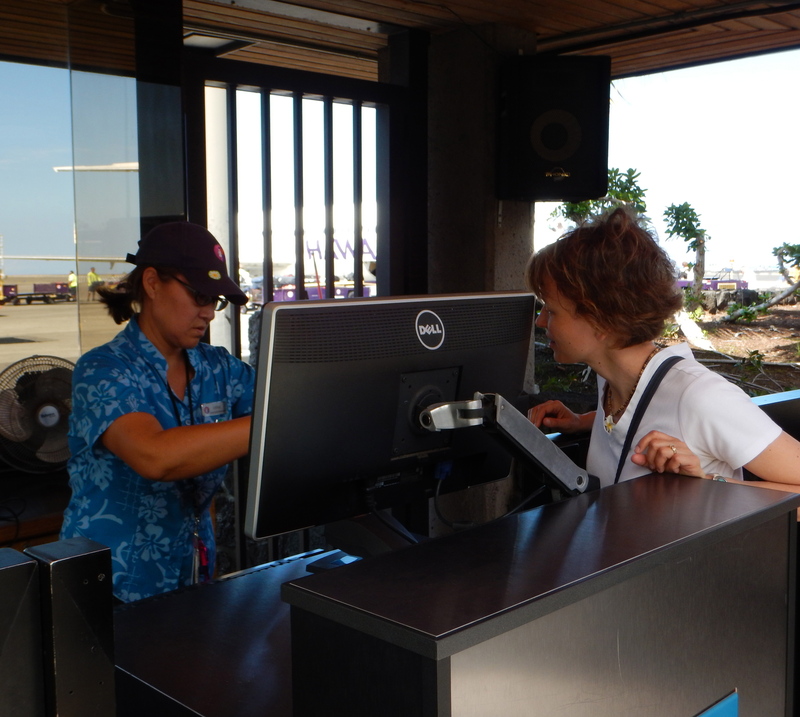 We flew Hawaiian Airlines to get from one Hawaiian island to another. Hawaiian Airlines made a note of our allergy when we called in advance. We were told that they do not serve food on these short inter-island flights and, indeed, that was the case. They allowed us to board our flights early to clean them. I asked for announcements, was never refused, but they never followed through with them, either. One flight attendant said she’d have to ask the Captain. I’m guessing he said no. We brought one set of Epi-pens and two sets of Auvi-Q’s. (We just happened to have both kinds.) And a doctor’s letter of course. The Epi-pens were in my son’s diabetes bag — always within reach. The back-up epinephrine was in the carry-on bag of medical supplies in the bin above our heads. We also had a fresh bottle of Benedryl and an asthma rescue inhaler. Early boarding ensured a good spot for that medical suitcase. Our travels involved a commuter flight aboard Skywest Airlines. Thankfully, we thought to check their carry-on size requirement as it’s more restrictive than Delta’s. Gate-checking a bag with medical supplies is NOT an option! We brought loads of safe food for my son to eat while on board. When I say loads — I means LOADS. We were eating strips of turkey, ham, cheese and veggies for days after our arrival. I always pack too much food but if we had an unexpected layover, I would be beside myself if N didn’t have safe food to eat! I can hardly conceive of that possibility. Stay tuned because I will post about how we managed meals and snacks on our 14 hour travel days. That is a long period of time to go without access to a kitchen or dining services. It really reduced my anxiety to feel that Delta had our back, making announcements, not serving peanuts on our flights and allowing us to pre-board to clean my son’s seat. Despite the fact that everything went well, I struggled with my own flight anxiety though. The kind of flight anxiety where you envision the plane falling out of the sky. When the pilot would warn us of upcoming turbulence, my heart pounded in my chest. The turbulence was never bad and yet I braced myself for the worst. That brought a smile to my face. My irrational fear of flying aside, it would be understandable for my son to worry about flying. Concerns about exposure to peanuts in the air, access to safe foods and managing blood sugars aren’t minor. But, instead, he has enjoyed the journey. And I can pat myself on the back for that. Planning for travel is a daunting task with a life-threatening food allergy. My son’s celiac disease and type 1 diabetes doesn’t make it any easier. Add my flight anxiety to the mix and you have a lot of good reasons to stay home. But we’ll keep setting off on new adventures. The fun we have as a family makes it all worthwhile. My son N is learning how to navigate airline transportation as a individual with a peanut allergy. You can add this to his repertoire which includes sleeping over at friends’ houses, taking the school bus and attending school (which is not peanut-free). The odds are stacked in our favor that our food allergic children will have uneventful flights — free of an allergic reaction. See Allergic Living’s article featuring Dr. Greenhawt as he discusses the risks of airline travel. This webinar may be helpful too. Some members of our food allergy community have had trouble with Dr. Greenhawt’s recommendations, feeling that airborne reactions aren’t being properly acknowledged. You know your child, his/her history and your allergist’s recommendations. If I had witnessed an airborne reaction from my child, I’m not sure I’d board a flight either. For the rest of us, making a airline reservation may not be such a bad idea. Informed and prepared, we show our children how to go out into the world and be safe. As long as there are nuts being served on planes, passengers bringing them on board and inconsistent airline policies, we need to be talking about this issue. Anaphylaxis is frightening! Our voices need to be heard. I’ve signed Advocate Lianne Mandelbaum’s petition to create consistent airline policies that better support individuals with food allergies. Have you? Disclaimer: Please do not take information from this blog as medical advice. I am not a medical professional. This blog is a collection of my thoughts, inspirations and resources related to travel and health challenges. 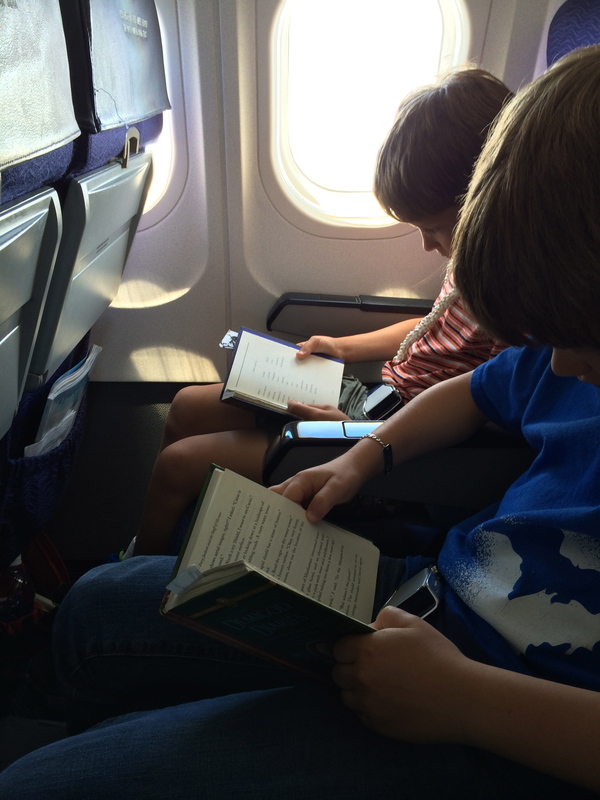 I share them from my perspective as a mom and fellow traveler. Contact your doctor for medical information specific to your situation.